Flossflower is the chief common name for Ageratum houstonianum. But the common name is seldom used in most circles. Instead, the public now uses the genus name so frequently that it doubles, in essence, as a second common name. Flossflower is an annual plant. A member of the Aster family, a good look at the flowers will reveal the resemblance to, for example, Joe-pye weed, another member of the Aster family. We tend to associate some flowers with particular colors, even though they do come in other colors. For example, when you hear "alyssum," you might think of white alyssum. When annual lobelia is mentioned, it's the one with blue flowers that, for me, comes to mind immediately, even though there is also, for example, a purple lobelia. Easy to grow, blue ageratum grows in compact mounds that generally reach a height of 1-2 feet. The rounded leaves do not add any aesthetic value to the plant. Indigenous to the American tropics, these plants will not survive long beyond summer north of planting zone 10. 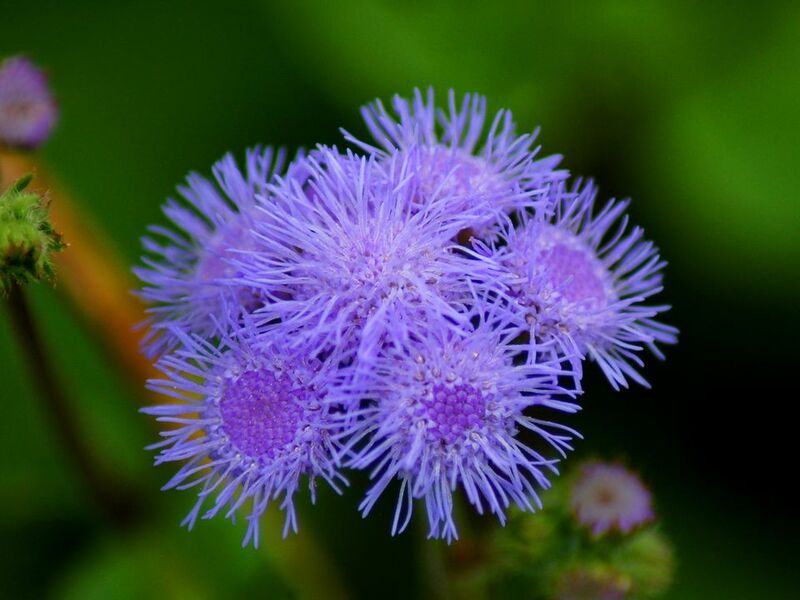 Plant blue ageratum in well-drained but moist soil that has been amended with compost. It is not fussy about soil pH, thereby increasing this annual's versatility. In cold climates, give it full sun. In the South, the plant can profit from some afternoon shade. Blue ageratum is a classic bedding plant. As an edging or "border" plant, it is meant to be displayed en masse. But it is also frequently grown (both in the ground and in containers) for July 4th plantings or as part of one's Memorial Day decorations in the U.S. (see below). Do you battle deer pests in your landscaping? Fortunately, blue ageratum is a deer-resistant plant. Deer are not stupid: these annuals are poisonous plants. These annuals are, however, plants that attract butterflies, so you have the best of both worlds. Blue ageratum is one of those annuals you tend to find for sale in masses at garden centers year after year. It is typically sold in cell packs. For those who landscape in cold climates, do not plant these tender beauties outside until you're sure your region has already received its last frost of the year. Even though mulching won't keep these tropical plants from dying off in winter in the North, that does not mean you should forgo using mulch on them during the growing season. A layer of mulch will not only suppress weeds but also help your soil to retain moisture. This latter fact is important in growing blue ageratum, as these plants do not like to dry out. On the other hand, being susceptible to powdery mildew, blue ageratum may balk at being watered from overhead. This is where drip irrigation can come in handy. There's another problem sometimes encountered with blue ageratum: spider mites. However, this pest is less likely to attack the plants outdoors, in a well-ventilated flower bed. Some gardeners deadhead this plant, but this care is not absolutely necessary. There are not that many choices among the commonly sold annuals for people who are seeking a "true blue" flower. That is why, for example, blue ageratum is so popular in the U.S. in plantings meant to express patriotism. Americans can easily find flowers in colors that correspond to the red and white in the U.S. flag. The blue component in such a color scheme is another matter. That last cultivar should not be confused with 'Heavenly Blue' morning glory. Ageratum houstonianum is called "flossflower" because of the tiny threads of each of the flowers that grow in clusters on the plant. As for the scientific name of the plant, the first thing you might see when you look at the genus name is "Age." Coincidentally, that is exactly what the origin of that name pertains to -- but not via our English word, "age." Rather, the Greek prefix a (without) + geros (old age, as in "gerontology") signifies that the botanists who named this plant were impressed by the ageless (i.e., long-lasting) nature of its flowers. Meanwhile, the specific epithet, houstonianum derives from the name of the botanist who was responsible for bringing this plant back from the American tropics and introducing it to the wider world: namely, 18th-century botanist, William Houston.